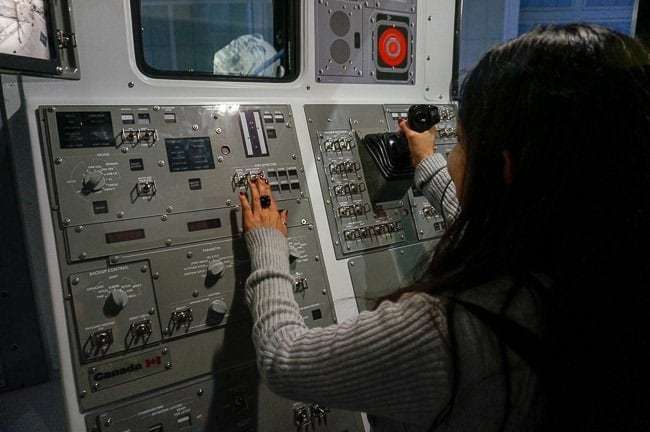 If you are traveling to Florida, I would highly recommend that you visit the Kennedy Space Center Tourist Complex, where you can get an up close and personal appreciation for the history of human spaceflight. 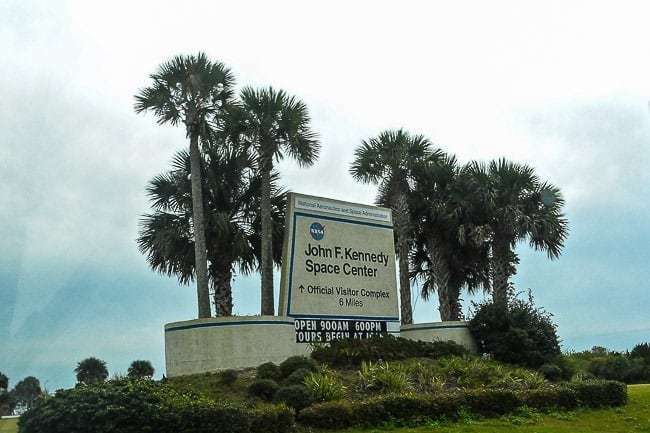 The Kennedy Space Center is one of ten NASA field centers, but since 1968, the Kennedy Space Center has been the primary launch center for human spaceflight, and is where they launched operations for Apollo, Skylab, and the Space Shuttle programs. The Kennedy Space Center is located directly due east of Orlando, located on the Atlantic Coast about halfway between Miami and Jacksonville. 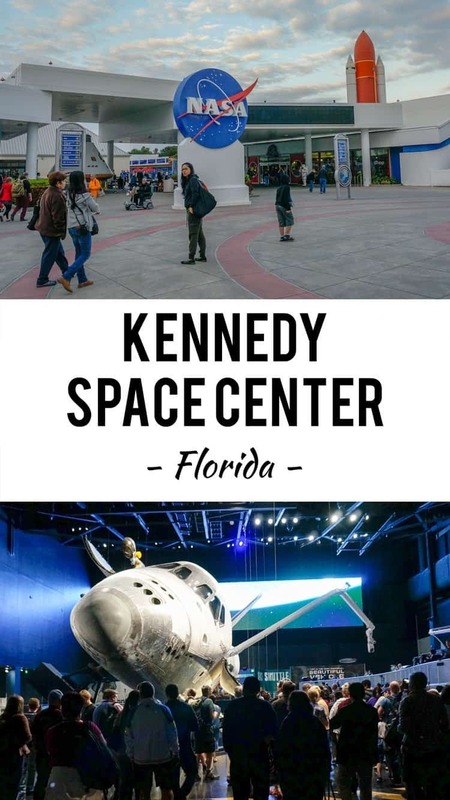 It is only a short one-hour or so drive from Orlando to the Kennedy Space Center and makes a perfect addition if you’ll be visiting Orlando for a Florida family vacation. 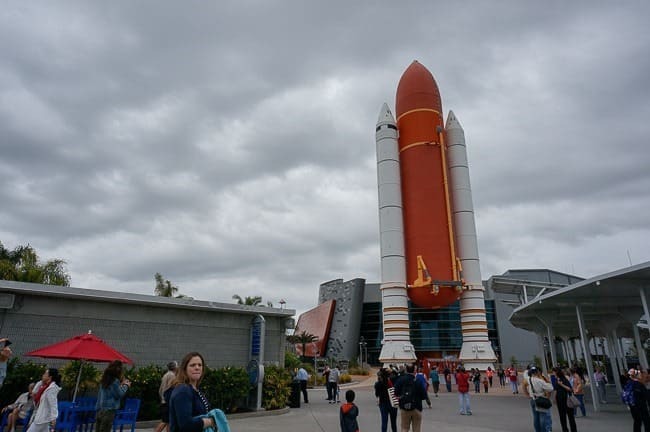 We drove up from Miami that morning — about a 3-4 hour drive — visited the Kennedy Space Center Visitor Complex, stuck around for the rocket launch (which was late due to delays), and then drove to Orlando where we had an Airbnb. It was a big, but doable day. 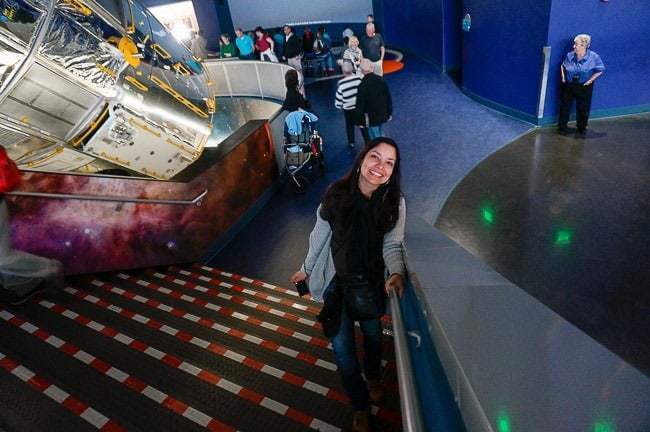 The Kennedy Space Center itself is a fun and educational visit. Personally, I’ve always been fascinated by the stars and space. I remember one of my favorite university science classes (and I didn’t like science classes) was an amazing astronomy class. It was might impressive to see these big, towering rockets in person. 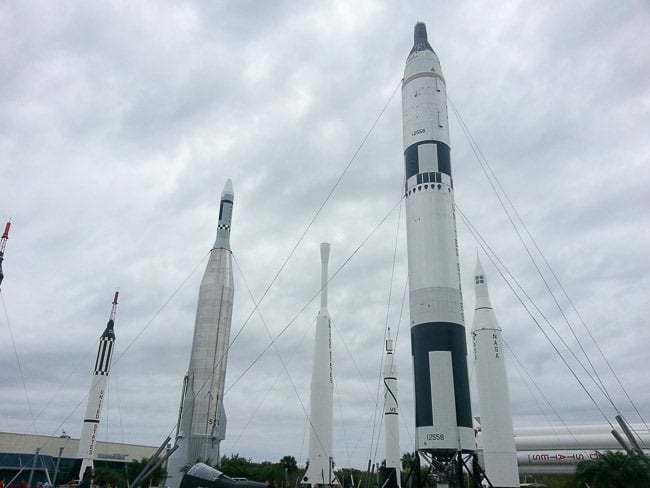 You can walk among the rocket gardens, learn about the moon landings and the Apollo program. 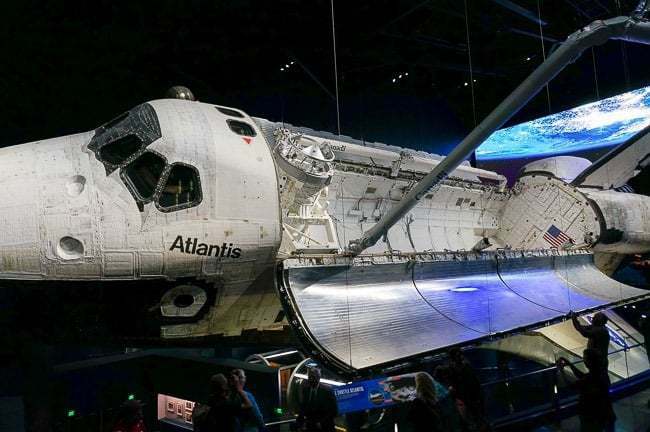 But the coolest part, I think, might be the Space Shuttle Atlantis exhibit. They have a great video that explains the history of the shuttle program, and then all of a sudden the movie screen lifts up and you’re staring at the real life version through a transparent screen. That screen lifts up and then you can walk right up the shuttle and take in the size of it. They’ve got a cool shuttle launch experience ride so you can strap in, tilt up vertical and then feel the g-force of a launch. Kennedy Space Center was unexpectedly fun and educational. Even Andrea’s 10-year-old nephew got really into it, despite the fact that it’s more educational in nature, rather than filled with theme park rides and attractions like over in Orlando. The highlight of our visit to the Kennedy Space Center for sure had to be going to the launch viewing area for Atlas V rocket later that evening. We boarded buses at the Kennedy Space Center and were driven off to the Apollo / Saturn V Center for the launch viewing. There were hours to kill before the launch, but we wandered around the indoor exhibits, and stood beneath the absolutely massive Saturn V rocket — the world’s largest — which stretch the length of the building. It was already dark and getting late, so we grabbed dinner inside the food court. Outside there are a series of bleachers and we managed to find a space for all of us along the bleachers with a view to the launch pad a few miles away, across Banana Creek. They pushed back the launch because of weather. 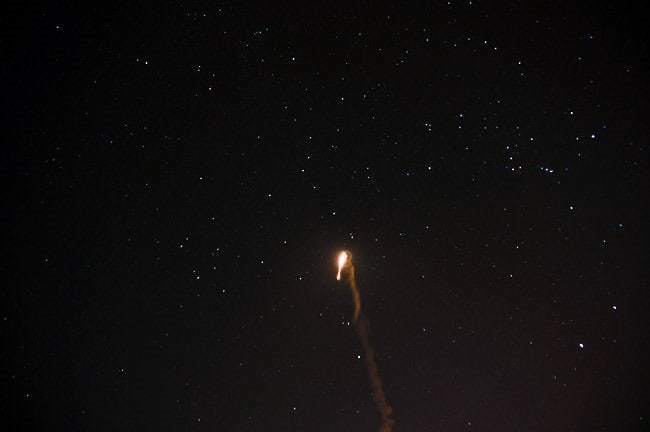 To us it appeared to be completely calm and perfect, but even the most minor disturbance can have major consequence for launching a rocket of this size and they have to make sure conditions are perfect. Meanwhile, we were worried it might get canceled completely. One hour ticked into two and still nothing… But then the time came, the countdown began, and the bright light from the rocket light up the sky, shortly thereafter followed by the roar of the engine, as it slowly lifted off the platform. It began picking up speed slowly as it arced up and out across the Atlantic Ocean. 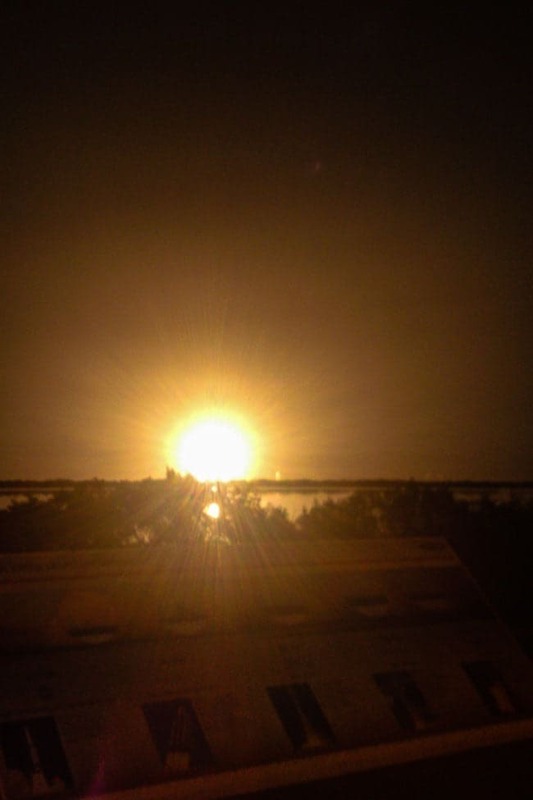 Sadly, I failed to take any decent photos of the launch — they were all overexposed since I hadn’t anticipated just how intensely bright it would be. The night sky turned almost like day. An unforgettable and special experience that just happened to coincide with the dates of our trip. It’s a must do if there is a rocket launch during your visit. 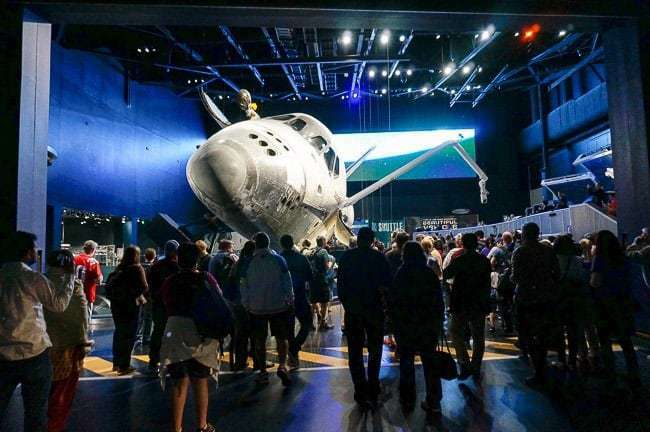 Click here to check out the Kennedy Space Center launch schedule to see if the planned dates coincide with your visit — of if you’ve got some flexibility, I’d recommend trying to plan a trip that will coincide. It’s truly a once-in-a-lifetime experience and something so incredible to see in person. 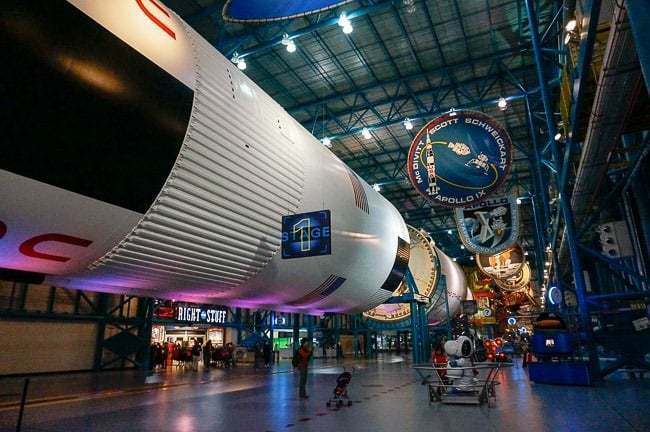 Kennedy Space Center tickets can be purchased online from their website. 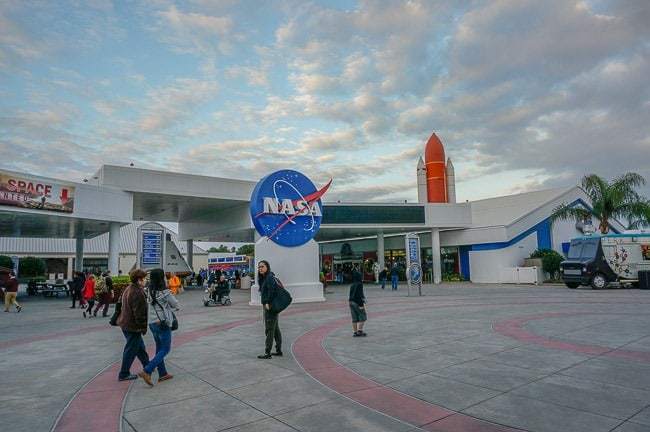 Kennedy Space Center hours feature different closing times depending on the season, but the center opens at 9am every day of the year. If you’re visit coincides with an evening launch, it isn’t necessary to arrive at opening time, but rather around mid-day in order to enjoy the visitor complex and be left waiting forever for the launch. Speaking of launches, be sure to check the Kennedy Space Center launch schedule prior to planning a visit. As mentioned earlier, we drove up from Miami in the morning, did the visit, saw the launch, then continued to Orlando in order to maximize our time. But if that sounds like a hassle, you could easily stay in nearby Titusville either before or after you visit the Kennedy Space Center. 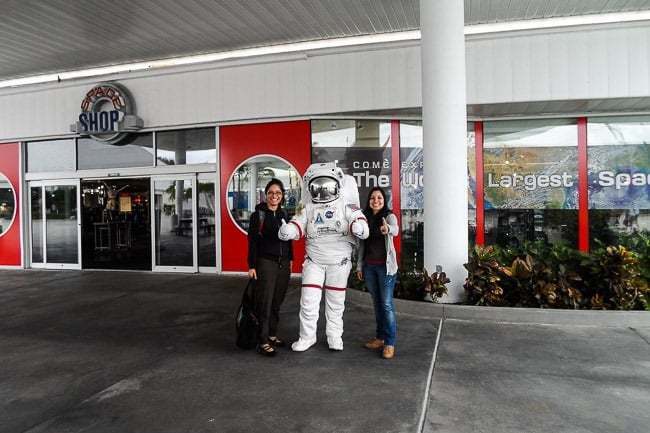 Traveling to visit the Kennedy Space Center on your next trip? Book the perfect room on Booking.com today! Living in Australia, back when I was a bit younger, I would get up around 2 or 3AM local time to watch some of the Space Shuttle day time launches live on NASA TV. I tried to memorise the entire checklist of major events from T minus 20 minutes. I would have the checklist printed out (something like 60 pages plus including some of the manual) and would follow along, with google always handy to tell me what all the acronyms were. I think to say I’d be excited to go to the space centre would be an understatement! Its the first place I’m going to when I do a holiday to the states. Hey Patrick, thanks for dropping by! That’s so awesome to hear that you followed the launches like that back in the day. It truly was a special treat to visit the Kennedy Space Center and I’m so grateful to ave gotten to see a rocket launch in person — so cool. Hope you get to make it happen soon, and hope that a launch coincides with your visit.